KWAJALEIN, Republic of the Marshall Islands (March 01, 2011) -- If Kwajalein Atoll is just two things -- at least from the perspective of the Americans who work there -- it might be both a paradise and a target. The coral sand beaches and crystal clear blue water make it easy to see why it might be a paradise -- at least for those who like to swim, dive or lay out in the sun. The ALTAIR (VHF/UHF) is a tracking radar on Roi-Namur. It is part of the Kiernan ReEntry Measurement Site. But the U.S. military presence at U.S. Army Kwajalein Atoll is meant to support the Ronald Reagan Ballistic Missile Defense Test Site, part of the Department of Defense Major Range and Test Facility Base. It's the location of Kwajalein -- a real, middle-of-nowhere place, about 600 miles north of the equator -- that makes it a valuable asset for missile testing. 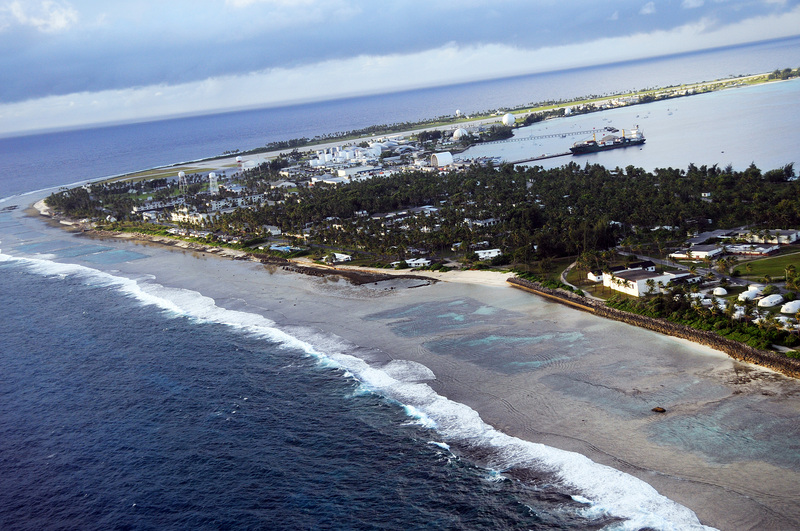 The sparse population, surrounded by the vast Pacific Ocean, makes Kwajalein an attractive place for weapons developers to test their missiles. That is, it's a great place for an unarmed intercontinental ballistic missile to smash into the water, another projectile, or the ground. The RTS also launches its own missiles, tracks objects in space, tracks new foreign launches, participates in technology development and hosts commercial space launch facilities. "Our primary mission here is missile testing," said Tim Hall of the RTS. "Because of our location, we can support all manner of missile tests with varying shots like the ICBMs off the west coast of North America, intermediate range shots from the Pacific Missile Range Facility in Hawaii, and shorter-range things from Wake Island and even neighboring atolls if it is necessary." What actually happens is that a customer, like the Air Force, will launch a missile, such as an ICBM, at Kwajalein. The customer has expectations as to what that missile will do during flight, how fast it will fly, when it will arrive and where it will land. "For most of the operational tests, they are interested in how accurate the weapons system is," said Kurt Schwan of the RTS. "Did it come down where we aimed it? They sort of tell us pretty accurately where it's coming down -- but they don't tell us exactly. We measure as precisely as we can where it came down and give that information back to them. It's their job to make that final determination: How accurate was the system?" "We're not only collecting those telemetry data on these missions, but in the case of RTS, very precise radar data and also optics data as those things scream through the atmosphere at about six kilometers per second," said Hall, adding that an ICBM can get, from California to Kwajalein in about 30 minutes. "It's important for people analyzing the test to know what's going on, on board the system," said Schwan. "They need to know those parameters so if something goes wrong they can use that data as diagnostic information for what went wrong." The Kwajalein Atoll is geared up with sensors, radars, cameras and other tracking equipment that can be used to follow the incoming projectile from Vandenberg Air Force Base, Calif., for example, and then report back to that customer how their missile performed. Information gathered at RTS includes missile telemetry, radar information, and even visuals of the missile reentering the atmosphere and hitting its target. 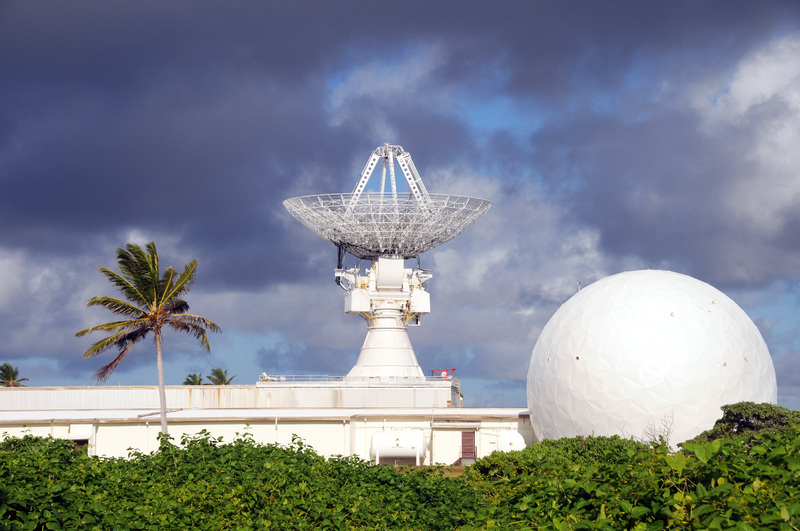 Included in the equipment on Kwajalein, Roi-Namur, and the other islands in the atoll that RTS has instrumented, is the Kiernan ReEntry Measurement Site, composed of the ALTAIR VHF/UHF system, the TRADEX L-/S- band system, the MMW Ka-Band system, and the ALCOR C-Band system. According to Hall, KREMS is the "heart and soul of the range." Systems like ALTAIR and TRADEX are tracking systems, he said, and can see deep into space -- tracking things in geosynchronous orbit. Systems like the MMW and ALCOR are less powerful but have more resolution. "We have a kind of complementary capability here," Hall said. "We have this deep-space tracking or long range of tracking with our big beam, high-powered radar. And then we have this complementary capability where we can image targets to get extremely high-fidelity information." Another RTS sensor in use at the RTS: optical devices that capture imagery of missiles as they move toward the island chain. The TRADEX (L-/S- Band) system in the center is a tracking radar, while the ALCOR (C- Band) system in the dome is an imaging radar. Both are part of the Kiernan ReEntry Measurement Site on Roi-Namur. "In the past we have (had) these ballistic cameras that actually had a film plate on the back of them," Hall said. "That entire suite is being replaced. All of these new cameras are electronic digital systems now, so we can collect data in a timely fashion and get it off the island to our customers more quickly and more reliably than we were able to." Hall expects the entire set of cameras on Kwajalein, Roi-Namur, Legan and Gagan to be replaced by the end of fiscal year 2012. It's not just ICBMs that are launched at Kwajalein, it's other missiles too. Some land in the lagoon, some in the ocean to the left or right of the atoll. Others hit land, such as on Illeginni. Hall said you can get the best location readings where the missile actually hits the ground, at the bottom of the sizeable crater they make. "They will actually go out with a global positioning system receiver and figure out where the middle of that is and that's where it hit," said Hall. "So we can track it with radar and we can track it with optics, but no kidding, if you really want to know where that thing hit, you go out to the hole in the ground with a GPS." Kwajalein also launches its own missiles from a facility on Meik Island. The facility, about 35 to 40 miles north of Kwajalein, is where the DOD launches both targets and interceptors as part of Ground-Based Midcourse Defense System and Aegis Ballistic Missile Defense System testing. "We support the Missile Defense Agency and the Ballistic Missile Defense System -- Patriot, THAAD -- and we man the Ground-Based Midcourse Defense System, which is in Vandenberg AFB and also Fort Greeley, (Alaska)," said the test site's director, Lt. Col. John M. Eggert. "The Army has a big piece in providing missile defense." The missile defense system, said Eggert, is designed to take out missiles from rogue countries. "The better you can make that system, the better the country is protected," he said. Part of developing that system involves launching "enemy" missiles, and then having a missile launched from Kwajalein intercept and destroy it. Now, Kwajalein is launching the "enemy" missiles toward the U.S. In turn, interceptors are launched from the U.S. to destroy them. "We've turned the tables, we're not the target anymore," said Hall. "We're launching at California and they are protecting themselves." The location of Kwajalein makes it a safe place to launch missiles at and from, said Eggert. "Our location has a distinct advantage when you talk about conducting high speed missile testing," he said. "We don't have major population centers that we have to protect like a CONUS-based range does." The population of the Marshall Islands, which included Kwajalein Atoll, he said, is about 66,000 and is spread over about 750,000 square miles. In the atoll, the population is about 16,200 -- most of that is located on Ebeye Island, about two miles north of Kwajalein Island. During launches toward Kwajalein Atoll, islands lying in a specific area -- known as the midatoll corridor (an area most likely to encounter an incoming missile) -- are made off limits to those who might otherwise be working there. "What that means for us is you can have a customer test the full capabilities of his weapons system without a lot of safety constraints," he said. Eggert also said the atoll's location makes it a great place to keep a look out for things launched by other countries. "Being west of the international dateline, it gives us the first look if anyone launches from Asia," Eggert said. "We're actually the first blue sensor in the space surveillance network to see any new foreign launches." Tracking objects in space -- like satellites and missile launches from other countries -- is another RTS mission. And they've got the equipment there to track just about anything. Space tracking equipment -- like the ALTAIR and TRADEX systems -- allows RTS technicians to detect launches from Asia, as well as perform their space-monitoring mission. "We track objects in deep space, mid-Earth orbit, and also low-Earth orbit," said Eggert, who added that the instrumentation they have on Roi- Namur is capable of tracking all orbital regimes. The RTS tracks some 50,000 objects a year through space, including foreign and domestic satellites and other objects as small as 10 centimeters. America's satellites in space may be vulnerable to foreign influence, and those satellites must be equipped with countermeasures to ward off such attacks. The team at RTS helps develop those countermeasures by probing domestic technology in space using known foreign-nation signals and frequencies. "Because of the unique capabilities of our instrumentation here, we are able to replicate some of the frequencies and waveforms that our adversaries have," Eggert said. "We could use those replications to provide some interesting information on some of the friendly satellites that we have up in space right now. So we can beam up a frequency that the Russians use, for example, and see how that satellite reacts to that waveform. So we use that to test countermeasures." The Reagan Test Site does more than work with missiles; it is also involved in technology development. It plays a role in developing the Hypersonic Test Vehicle, for instance, which may one day replace ICBMs. "It's a hypersonic glide body that can actually go exoatmospheric and endoatmospheric," said Eggert. "You can actually control the flight of a hypersonic vehicle. It's very difficult for an adversary to hit, and also for an adversary to track." The team at RTS also hosts commercial launches from companies like Space-X and Orbital Sciences. 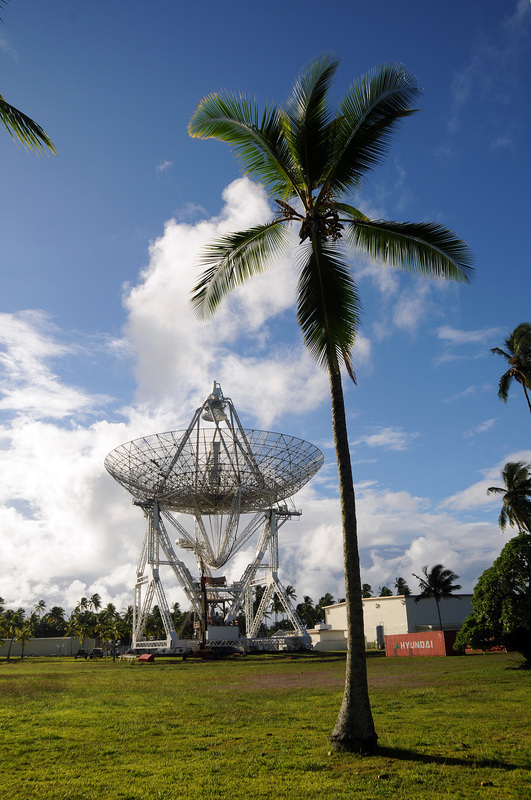 The location of Kwajalein, near the equator, means it takes less fuel -- and less money -- to get objects into space. "We're doing a lot of important national-level work out here that most don't realize is going on," Eggert said. "Testing and evaluating acquisition programs of national prominence or doing space operations to ensure we have assured access to space assets -- that's the main reason we're out here."